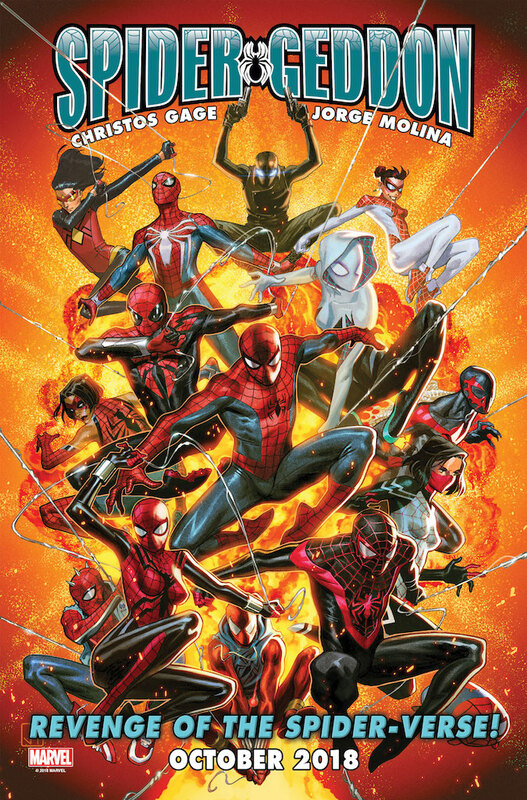 New details emerge on Spider-Geddon as the Marvel Comics event draws closer to release – AiPT! Dan Slott isn’t done with Spider-Man yet. Or more specifically, he’s not done with the Spider-Verse! Today Marvel Comics has revealed the upcoming Spider-Geddon series will be a revenge series in response to Spider-Verse. As editor Nick Lowe puts it, “SPIDER-GEDDON straps dynamite to that stage and blows it to smithereens.” Christos Gage revealed even the new PS4 Spider-Man will be making an appearance. Dan Slott is teaming up with Christos Gage with artist Jorge Molina for this epic sequel series. Before Spider-Geddon begins Edge of Spider-Geddon kicks off August 15, 2018 with a Spider-Punk story. Spider-Geddon #0 arrives this September with art by Clayton Crain and written by Christos Gage. For more info on Spider-Geddon read the press release below. New York, NY–June 29, 2018–Spinning out of the pages of Spider-Man #800, Dan Slott’s epic conclusion to his ten year run delivers you straight into SPIDER-GEDDON #1, where Slott teams with writer Christos Gage and artist Jorge Molina to bring Marvel’s Spider-Heroes together in one of the most epic stories ever!